The Internet Society, in partnership with COMSATS Internet Services, has since December 2015 been implementing a pilot initiative in Chak-5 Faiz, a rural village in Pakistan, as part of the Wireless for Communities Programme. This case study documents the impact of empowering teachers and students with digital tools and skills at the Government Girls High School located in the village, and highlights some key takeaways that other community network projects can apply. Find out more about the pilot initiative at http://wforc.pk. Wireless for Communities (W4C) is an award-winning programme initiated in 2010 by the Internet Society Asia-Pacific Bureau. The W4C programme focuses on last mile connectivity in rural and remote areas. It involves developing communities’ capacity to build and operate the wireless network, and empowering them to create and use digital services. The W4C programme is currently being implemented in three countries in the Asia-Pacific region – India, Nepal and Pakistan. Find out more at https://www.internetsociety.org/projects/w4c/. Two years ago, the Internet Society and COMSATS Internet Services, a local Internet service provider in Pakistan, ventured into Chak-5 Faiz, a rural village in the Punjab province, 25 kilometres from the city of Multan. At that time, some of the villagers had to walk two kilometres to access the Internet. Little did we know, tucked away in this village was a hidden treasure at the Government Girls High School in Chak-5 Faiz. At the school, we discovered a fully-equipped computer lab with nework facilities that was locked up and unused. It was unused because no one knew how to set up and use the equipment in the lab. As part of a pilot initiative of the Wireless for Communities Programme, we worked with the local community to establish an Internet connection at the school, and there has been no turning back since. Teachers and students have been making full use of the Internet by accessing information, developing their digital literacy and finding innovative ways to use the Internet. 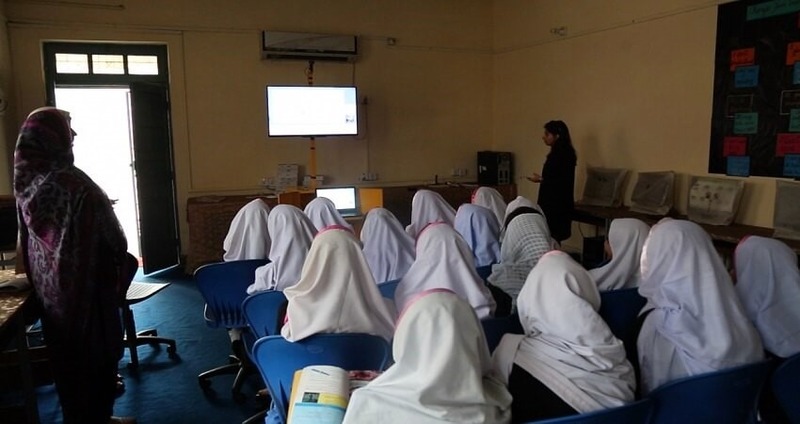 The school connected with Tele Taleem, a local organisation based in Islamabad that specialises in online education, to improve the quality of teaching as well as students’ learning experience. 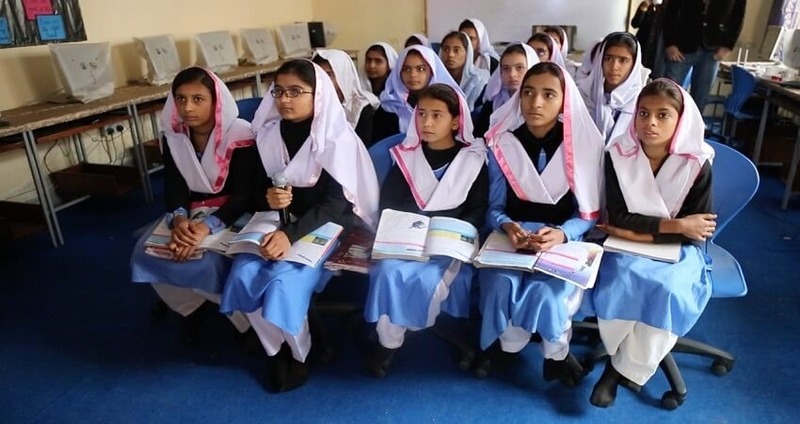 This led to the offering of a series of online supplementary education sessions by teachers in Islamabad to 40 sixth-grade girls at the school over a three-month period. The curriculum was tailored by Tele Taleem to boost the girls’ understanding of their existing studies in English, Mathematics and Science. These online sessions were meant to supplement students’ classroom learning, and not replace them. 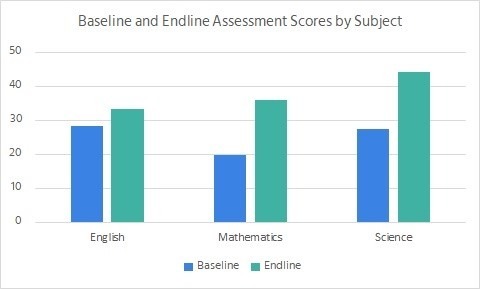 To evaluate the impact of this online supplementary education initiative, baseline and endline assessments were carried out, and results show evidence of improvements in students’ grades after the three-month online sessions (see figure below). Additionally, records and interviews with teachers and students show increased attendance and greater interest to learn in school (see video). According to a study by UNICEF, Pakistan has one of the world’s lowest school completion rate, particularly among rural girls. The results from the online supplementary education initiative have important implications for improving educational quality, school attendance and school completion rates, as well as gender equality. This case study reinforces how the Internet can contribute to socioeconomic development and the achievement of the United Nations Sustainable Development Goals. It is not just about laying the infrastructure, but what we can do with it to better people’s lives. In Pakistan, about three-quarter of its population still do not have access to the Internet, and two years ago, residents of Chak-5 Faiz village were among those without access. COMSATS Internet Service, the local partner, played a key role in establishing connectivity by providing a dedicated 10 Mbps bandwidth connection to the community network, as well as technical support from a group of network engineers. The wireless base station – a 55-metre tri-polo tower attached with wireless antennas – was constructed to connect communities within a two-kilometre radius using unlicensed spectrum. 1. Building the network infrastructure is insufficient. Its use and relevance must also be established. 2. Always conduct a survey to assess the resources and needs, and identify opportunities. 3. Ensure local ownership and buy-in from the community by involving them from the start in planning and establishing the community network. This also promotes the sustainability of the project. 4. Connect with local implementation partners and make use of local capacities and resources. 5. Always incorporate awareness raising and capacity building in planned activities. 6. Consider a phased approach where the first phase focuses on infrastructural set up. Subsequent phases should involve regular follow-ups over a period of time to provide technical support, awareness raising and training. 7. Plan to monitor and measure impact from the start. 8. Adopt a training-of-trainers approach to create a multiplier effect and expand the overall impact. A community survey was conducted to assess connectivity needs and opportunities. That was when the project discovered the computer lab in the Government Girls High School in Chak-5 Faiz. Once the local government granted permission for the project to provide Internet access in the school lab, the receiving antenna was installed and connection was established within just a few hours. Right away, the school started organising regular computer and Internet classes for its 200 students. Based on the community survey, the project also established Internet access at a local polytechnic institute and within a cluster of 25 households. To ensure the sustainability of the community network, the team of network engineers visited the village on a monthly basis over a six-month period to provide training on managing and maintaining the network equipment, including troubleshooting techniques. In the two-year period, the network did not experience any major breakdown and the villagers even purchased an Uninterruptible Power Supply Unit to keep the Internet running on a continuous basis. Global studies have shown that the Internet is not being used even when it is available. Some of the key barriers to Internet use include the lack of relevant content and the lack of digital skills. Besides technical training, the project demonstrated to girls at the high school, students at the polytechnic institute, and residents in the connected cluster of households, ways to access relevant information and services on the Internet. A training-of-trainers approach was used to enable those who have been trained to share their knowledge with others in their community, creating a multiplier effect and expanding the overall impact of the project. The Government Girls High School in Chak-5 Faiz is planning to continue offering online supplementary sessions to its students. There are also plans to introduce a similar online course for students in the polytechnic institute. By revisiting what they have learned in the classroom, getting to grips with new digital tools, and opening up to thinking about the world around them, girls at the high school in Chak-5 Faiz can build the resilience they need to cope in an ever-changing and complex society, and even build the capacity to begin breaking the barriers they face because of their gender and income level.